The Rosa Luxemburg Foundation, an affiliated trust of the German political party, Die Linke, has published a pamphlet on Greece and the Eurozone crisis (thanks to James Heartfield for the tip). It is interesting to read its take on the crisis: Die Linke after all was founded at the time when the German government was pushing through its competitiveness drive. Building on the social fall-out from the SPD-Green coalition government’s Agenda 2010 policies (see earlier post), Die Linke has carved out for itself a steady 10% of electoral support. The pamphlet is therefore a good illustration of what those to the left of the SPD in Germany today have to say on the crisis. 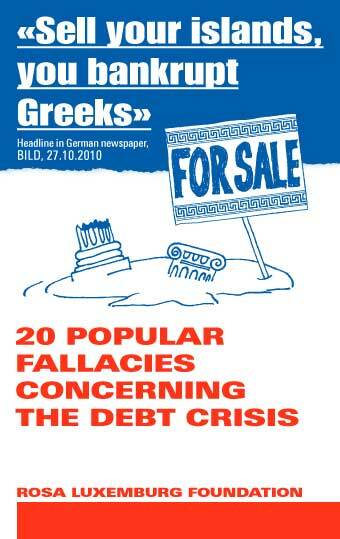 The pamphlet is written in the form of a series of supposed fallacies concerning Greece and the debt crisis. It aims at puncturing the myths that have dominated German tabloid discussion of the issue in recent months. It is also aimed at challenging some of those myths peddled by Angela Merkel in her public statements. It challenges most of these myths convincingly. On the causes of the debt crisis, it notes how debt alone is not necessarily a problem. What matters is the interest paid on it. As markets begin to speculate on the likelihood of a Greek bankruptcy, its borrowing costs soar. We have seen this in the case of Greece and we are seeing today with Italy. The pamphlet also comments on the zero-sum nature of German growth within the Eurozone over the course of the 2000s, a point made on this blog. “The German success”, writes Stephan Kaufman, author of the pamphlet, “was… merely the inverse image of the failure in the Euro periphery, because Germany would not have gained surpluses if it had not been for the deficits in Greece, Spain and Portugal” (pp9-10). The pamphlet attacks some of the popular myths around work shy, holiday happy Greeks. In fact, the average working week for Greeks is longer than for Germans (44.3 hours in Greece; 41 hours in Germany – p5). Greeks retire on average a little later than Germans (at 61.9 years of age according to the OECD, cf. 61.8 years of age for Germans). The pamphlet also makes the good point that German loans to Greece are not paid for by the German taxpayer straight out of national income: they take the form of loans raised by the German governments in international markets, at a low rate of interest (p18). They are not ‘gifts’ or subsidies, they are investments which the German government calculates will earn them a healthy rate of return. The pamphlet itself is limited by its own format as an attack on reigning myths. Identifying the fallacies is a starting point but the pamphlet says little about what it thinks should be done. On that point, it is laced with a curious Euro-chauvinism. It believes that any Greek default or write-down of its debt will do more harm than good as it might spread contagion and would lead to significant losses for European banks. The pamphlet cautions against contagion as it might spell the end of the Eurozone, “which is the backbone of the Germany economy” (p14). It goes on to argue in favour of the Euro on the grounds that it aspires to be “a world currency that can compete with the US Dollar” (p15). Such arguments contain their own myths. The Euro is hardly the backbone of the German economy: Germany has used it to its advantage and has exploited the imbalances of the Eurozone. But its export-led boom does not depend on the Euro as such. It depends upon the containment of wage growth in Germany relative to its export markets. It seems perverse for the German left to defend the Eurozone in the interests of German labour when the Euro has been used as one the main justifications for the government’s growth model that excludes the possibility of wage rises for workers. The pamphlet also fails to address one of the key problems: a lack of political leadership in Greece. One of the reasons why the crisis seems so intractable is that the Greek government cannot contemplate leaving the Eurozone. The ability to re-issue its currency, introduce capital controls and win the population to a long-term national project of economic renewal, is evidently beyond the Papandreou government. It sees no future outside of the endless negotiations in Brussels. Those out on the street in Athens, fed-up with the ongoing austerity measures, do not seem to believe in political solutions at all, preferring to dismiss both their own leaders and those of the EU and the IMF. The pamphlet itself fails to see this problem, reiterating instead the common view that the problem lies in the power of the markets. Yet the markets are divided: some argue for a Greek default and exit from the Eurozone; others suggest this would be the beginning of an unmitigated economic meltdown in Europe. Both can’t be right. The best option for Greece would be to default on its debts and leave the Eurozone. Yet few, if any, in Greece seem to believe in a re-issued Drachma. Until that changes, the impasse will continue. As your resident gadfly, I feel called upon to point out that you assent rather too readily to Die Linke’s economic reasoning. If it is wrong to say that only the size of the debt matters, it is also wrong to say that only the interest rate matters. What matters is, jointly, the growth rate of the debt as a percentage of GDP, which is a function of the primary balance (budget surplus or deficit exclusive of debt service), the growth rate of the economy, and the interest rate. For discussion and references, see http://slackwire.blogspot.com/2011_06_01_archive.html. In the Greek case, the problems are manifold. The primary balance is negative, not only because of the recession but also because of the inefficient tax system. The accumulated debt is large, already more than 120% of GDP. The growth rate of the economy is low, because Greek productivity is low compared to the rest of the EU. And interest rates are high, because all of the preceding factors lead market participants to deduce a high risk of default. I think it’s also rather too simple to suggest a neat symmetry between large German trade surpluses and high Greek borrowing. The German wage restraint to which you refer allowed Germany to export to many markets other than Greece; indeed, exports to Greece are only a small share of total German exports. Greece is a tourist destination, where Germans spend the profits they make exporting to the world. And it’s not as if the Greeks borrowed in order to sustain the German export machine. They derived many benefits for themselves, in some cases imprudently, without adequate consideration of whether or how the borrowing would increase productivity sufficiently to repay the loan. Default and exit from the Eurozone may not be the best option, either. A scheme under which the Eurozone as a whole assumed a substantial portion of the outstanding Greek debt and issued bonds backed by the full faith and credit of all Eurozone states would spread the burden of repayment over a much larger tax base, better able to afford it. The problem, of course, is that this would establish a precedent for other states in difficulty. I’m not sure what the total Eurozone sovereign debt is compared with Eurozone GDP, but some system of burden sharing and fiscal transfer would, in my view, be preferable to exit and collapse or pan-European austerity, which is self-defeating. But this would require a level of cooperation not yet seen in Europe, or else a superstate, and it’s probably not something that can be assembled in a crisis. Art, thanks for that and I agree with you on the first two points. The Die Linke pamphlet makes valid points, none of which however are adequate on their own. But as standalone rebuttals of some of the conventional wisdom, they are worthwhile. For debt, growth rates matter as much as interest rates, which goes a long way also to explaining Greece’s problem. And though Germany exports only a relatively small proportion of its overall exports to Greece, it does rely on exports to other Eurozone countries far more than it does to the rest of the world. And in that sense, its export success is predicated on the rest of the Eurozone being willing to buy its imports, hence the zero-sum nature of the German model which has been a theme of some of the posts here. On the final point, you also seem wary of the Eurobond solution and I think you are right to be cautious. Whilst the heady leap into full political union is the (apparent) dream of a few Europhiles, this would be politically difficult to sell to domestic populations already aware that much is going on without their say so or knowledge. The advantage of a Greek exit from the Eurozone is that it would be a manner of reasserting Greece’s own control over its economic policy. The problem seems to me that Papandreou’s goverment doesn’t want that kind of responsibility. And to be honest, I don’t think leaders in Europe want the responsibility of an integrated European state either. What exists at present corresponds to their own limited political ambition and imagination. Exit also poses huge problems. The Greeks would still need to borrow because of their primary deficit, and who would lend to them after repudiation? If word leaked, there would be a massive run on Greek banks, since no one will want savings forcibly converted to the drachma, which would be a very weak currency. The weakness of the currency would be another form of austerity imposed on the Greeks, who would find it difficult to import–and Greek is far from a self-sufficient economy. The gain in “sovereignty” is small compensation for the loss in welfare, which in my estimation would be greater than the welfare loss entailed by externally imposed austerity. Finally, I think that exit would set a dangerous precedent, encouraging “economic nationalists” across Europe to believe that it’s every nation for itself, beggar thy neighbor, and devil take the hindmost, an even surer recipe for depression than ECB-imposed austerity. To be honest, I’m not sure whether such a pessimistic scenario would play out in the case of a Greek exit from the Eurozone. Take the new currency. Might it not, if the exit is followed up by a plausible and more popular plan for returning Greece to some kind of international competitiveness, lead to a strong currency? The Euro, after all, is stronger during all these convulsions as people begin to imagine a smaller and economically stronger Eurozone. Fundamentals drive currencies over the medium to long term don’t they? The problem as it stands is that few people really believe that the austerity plans in Greece will work, hence the stubbornly high borrowing costs for Greece. Part of that is to do with the plans themselves: privatisation for instance does not work as a quick way to raise revenue. But more generally, unless the plans are actually implemented on the ground on the day to day, Greece will not turn the corner economically. And that depends on the relationship between the Greek population and its own government, which is very poor at the moment. Might not a national strategy, driven by a Greek government in control of its own affairs, be a better bet than having European Commission officials sit alongside Greek tax collectors? But all this seems a little utopian as the central issue is that there is no powerful movement in Greece for a return to national autonomy in economic policy. What is more likely is a continuance of the unhappy status quo, or pushing Greece more towards a protectorate run by other Eurozone governments and EU officials. In the long run, you could be right, but in the short run, exit from the euro would make matters much worse. To increase competitiveness, the drachma would have to be devalued. Even if all sovereign debt were repudiated, many Greek households and firms owe debts to foreign creditors denominated in euros. Their debt burden would be increased because of the devaluation. The reason why the Greek political class finds the idea of leaving the Eurozone unthinkable at this point is that it faces a huge legitimacy problem – a historic legitimacy problem in Greece that was only attenuated in the post-1974 period that saw a democratic Greece link its aspirations for progress to the EU project. Precisely because the material basis of that vision is now evaporating, it is very important to remember how important it has been. “European standards” (often mythical) have long been the measure that Greeks use to gauge their country’s success or failure. This striving to become “like Europe” in everything from living standards to lifestyle to environmental sensitivity to bureaucratic efficiency constituted the basis of the national vision for several decades. As that vision withers, we shouldn’t hold our breath waiting for the political class to find a replacement. Visions don’t grow on trees. So it’s not surprising that in the face of a political and economic abyss, the political class is clinging for dear life to even to the jaded idea of the EU, which has to bail the country out politically as well as economically. There’s something naively Monday-morning-quarterbackish in all the different kinds of advice being meted out to Greece. Suggestions, for example, that Greece should quit the eurozone, seem to be utterly unconcerned that the current financial debacle is a product of Greek leaders’ idiocy (the same idiocy that threw the US and EU into crisis). The idea that these same people can now have an epiphany, get things right and – hey, who knows, maybe even make the new drachma a proud, sound currency (I think in business-guru-speak they call it not wasting a crisis) – is unfounded, and the fact that people suggest it reveals a superficial approach to analyzing such crises as the present one. Greece’s problem is not that it hasn’t got the right policy, but that it is a very uncompetitive economy in a world of hellish competition. Greece has always been a junior member of the Western club. As such, it has always imported its policies and ideas du jour. US housing bubble based on easy cash and federal loan guarantees? Greek housing bubble based on easy cash and central government loan guarantees. Low interest rates from the ECB? Low consumer loan rates in Greece. Because Greece follows other Western fashions, its weaknesses are a reflection of Western weaknesses. Over the three years of this crisis, nothing coming out of the Greek political class suggests that is either understands the nature of the country’s problems or has the will to solve them. The giveaway behind the bravado that politicians so often use is the fact that the only real issue ever discussed is where the next cash fix is going to come from. “Reform” is not about figuring out how to develop productive industry, but about how to get more tax money into the till, more bonds rolled over, and, perhaps most telling of all, how to stop the rating agencies (ie, “speculators”) from giving Greece bad marks. Like I said, don’t hold your breath. The Eurozone may not be the “backbone” of the German economy in a traditional sense but it has certainly become a sort of skeleton upon which much of the flesh of recent years has been built. A significant part of Germany’s economic growth and the profitability of its industries over the last decade has come from outsourcing production to lower-wage Eurozone economies. The collapse of the Euro would be quite devastating to transnationalised German capital and have serious repercussions for the German economy. The Germans aren’t just fighting to save the Euro for sentimental reasons. That said, you are quite right that it is bizarre of Die Linke to defend the Euro, precisely for these reasons – it has not simply been used rhetorically to argue against pay increases, but materially as well, by expanding the labour force available for German capital to exploit without the transactions costs and regulations associated with multiple currencies and labour regimes. Dave M, I agree that the Greek political elite is unlikely to have a great and new idea any time soon, breaking with what is a historically entrenched tendency to think of Greek’s social development in terms of its place within the Europe-wide division of labour. But it’s important to stress that the lack of ideas resides as well across the population as a whole: support for the austerity measures is very mixed but a lack of faith in the effectiveness of their own political class is near-universal. Many prefer the Brussels plans for that reason. Under those circumstances, what to do? Come up with new ideas for a start. Argue for positions that would reveal the emptiness of the Greek elite’s European commitments. This is what we’re trying to do here. dear chris, thanks a lot for your review of my … well, i would call it a brochure not so much a pamphlet (maybe in english “brochure” and “pamphlet” have the same meaning, in german anyway “pamphlet” means something more political, polemic). one short reason for that: what i wrote is in my view not especially anything “left”. it’s just the facts, numbers & figures that i collected. that is not yet very progressive or anything, it is just “better” economics. because of that i think you mistakingly accuse me of euro-chauvinism. what i wanted to say in the brochure was just: the euro-masters want to install a currency that can compete with the US-$, so in order to achieve that, they probably have to “save” greece (in fact they don’t try to save greece, but try to save the euro-zone from the fall out of the greek crisis). a “left” position should definetely challenge this stance (as you do) and additionally ask different questions. above all: what kind of inhuman economic system is that, where the well-being of millions of people depends on the development of bond yields and credit spreads? should we really keep this system, where every country’s, every company’s, every man’s and woman’s right to exist is directly connected to the fact, that it/he/she produces a surplus in the form of profit = money (not only for the financial markets)? but that would be a very different brochure – or a pamphlet in the german sense.